McCurry owner P. Suppiah: "We're very relieved -- much, much relieved"
(CNN) -- McDonald's probably won't be exclaiming "I'm Lovin' It" in this case. McCurry restaurant owners A.M.S.P Suppiah and his wife Kanageswary Suppiah. 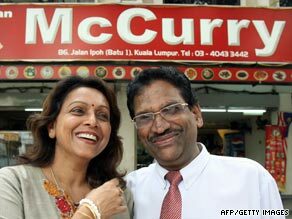 In a David-and-Goliath match-up in the world of fast food, McCurry -- a small Indian curry shop in Malaysia -- has won an eight-year legal battle against the hamburger giant. McDonald's claimed that the prefix "Mc" in McCurry trampled on its trademark. The country's Federal Court on Tuesday ruled that it didn't. "We're very relieved -- much, much relieved -- that this eight-year-old saga is finally over," said McCurry owner P. Suppiah. "We're a typical South Asian-Malay cuisine. No way people walking into McCurry can confuse us with McDonald's." The sparse 24/7 self-service restaurant in the capital, Kuala Lumpur, is popular with blue-collar workers who are drawn to its affordable fare, such as biryani rice and fishhead curry. Its logo: a chicken flashing a thumbs-up. The eatery opened in 1999. McDonald's filed suit two years later. "We were shocked that such a big giant wants to take us to court," Suppiah said. "We felt that we had nothing in common, because we were not selling any Western fast food." The hamburger chain, which has 185 restaurants throughout Malaysia, said McCurry was violating the prefix "Mc" and that McDonald's had the right to protect it. McCurry, in turn, said the prefix is common and is part of last names all across Europe. Furthermore, it said, the "Mc" in McCurry stands for "Malaysian Chicken Curry." A lower court ruled in favor of McDonald's, and Suppiah appealed. An appeals court in 2006 overturned that ruling, prompting McDonald's to appeal this time. On Tuesday, the Federal Court -- the highest in the land -- held up the appeals court ruling. McDonald's said it accepts the judgment. "We respect the finding of the court and beyond that have no further comment," said Liam Jeory of McDonald's Asia Pacific, Middle East and Africa region. Suppiah said the ruling means he can now add other McCurry locations, with its slogan: "Tasty and so Gooood."